CoCo is a Foster dog from easternherdingdogrescue.org who needed a safe place to whelp and care for her pups until they reach adoption age. 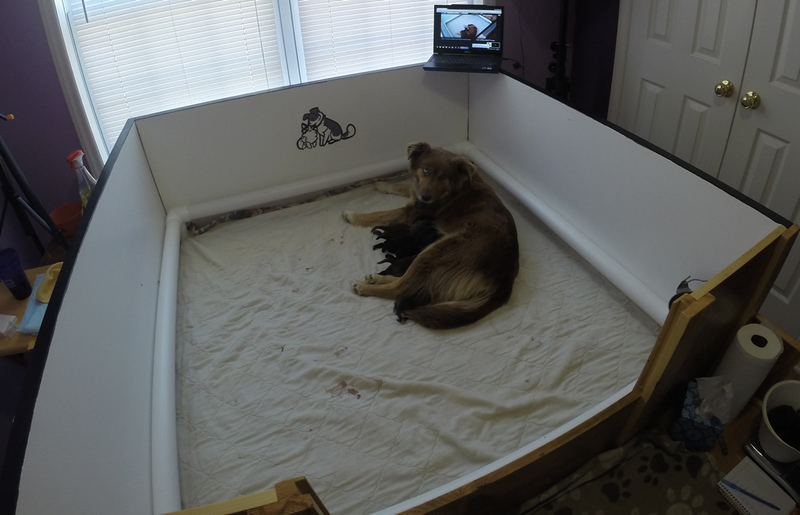 On 3/27 and 3/28 she gave birth to 7 healthy puppies. This is a live feed of their indoor living space. They’re starting to play and their personalities are coming out. They will be exposed to all kinds of new sights sounds smells and experiences. The idea is to get them used to all the things they will need to live and function well in their future forever home. CoCo and her 7 “CoCo pups” were born on 3/27 and 3/28 CoCo Whelping Pups to see the birth video. Camera is out of focus. The camera auto focuses. Sometimes it gets confused… Technology is great when it works. Not so much when it does not. The dark floor confuses it I’m sure.